Unbeknownst to the general public, picking a lock can be a very easy process once you get the hang of it (yes, surprising AND frightening). A vibrating lock pick set takes the general ease of picking even further by speeding up the process. Now, with the help of Invent Geek, you can make your own DIY Vibrating lock pick for about a tenth of the price of a manufactured kit. "Any time a new gadget comes out that speeds up the ability to pick a lock it is often extremely overpriced. 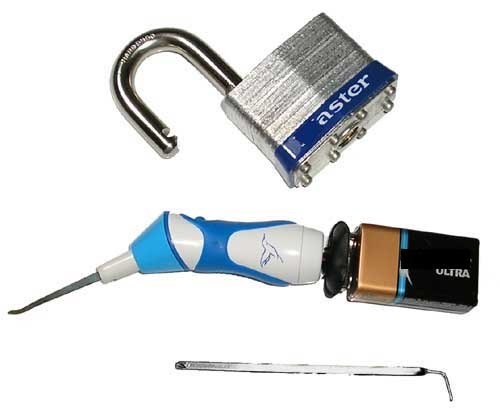 One of these types of tools is the vibrating lockpick. 60-120 bucks for a vibrating lockpick was a bit ridiculous in my opinion, so I decided to come up with a cheep way of making a good vibrating lock pick. For about 9.00 and a half hour we have produced a comparable lockpick to the most expensive commercial ones." Click through for the full tutorial. Note: To be used for sport, NO evil (please). Previously, Download MIT's Ultimate Lock Picking Bible (FREE). Crack a Master Lock - Mathematically, No Shim. HowTo: Conquer a Chain Lock (You Will Need: 1 Rubberband).